Pre-orders for the new "budget" iPhone XR have just started and the stock is already depleting, pushing multiple versions's shipping dates to up to two weeks. 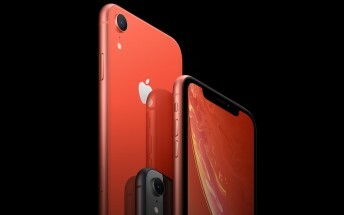 Analysts earlier this year predicted that this will be the best-selling iPhone and it has the potential with a price tag of $749, which is considerably less expensive than the $999+ iPhone XS and $1099+ XS Max. In the US, T-Mobile has already sold out the 128GB and 256GB yellow version of the phone and the same goes for the coral and red 128GB models. In the UK, the yellow, coral and red 64GB variants are hardest to find. In Germany, for example, the yellow 64GB alteration now has a wait period of up to 2 weeks while for the coral and red version (still base 64GB), the pre-order page shows 2-3 weeks waiting. The same goes for France and China. Given that, it's safe to assume that Apple fans are most interested in the yellow, coral and red paint jobs.